1. Anne of Green Gables by L. M. Montgomery. 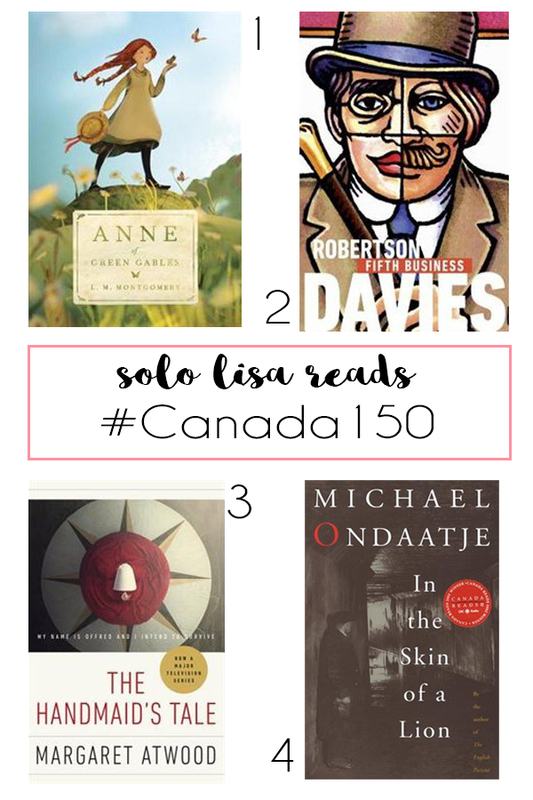 This classic novel about a redheaded orphan growing up in 19th century Prince Edward Island is arguably Canada's best known book and a longtime favourite of mine. Elderly siblings Matthew and Marilla Cuthbert set out to adopt a boy to help with the work on their farm, but by mistake a girl is sent. The coming-of-age story has charm in spades, from Montgomery's descriptions of rural PEI and its natural beauty to Anne Shirley's spirited, imaginative, and talkative personality. If you've never read it before, you'll want to pick it up before watching the Netflix series Anne (which is beautifully done, by the way). 2. Fifth Business by Robertson Davies. Growing up in rural Ontario pre-WWI, young Dunstable Ramsay gets into a snowball fight with local spoiled rich boy Percy Boyd Staunton; Percy throws an icy snowball concealing a rock at Dunstable, who ducks, and the snowball hits a pregnant preacher's wife, Mrs. Dempster, in the head. This seemingly innocuous event sets in motion a chain of events that inextricably links all parties for decades to come. Davies's novel recounts Ramsay's life, veering from WWI and Canadian and world history to hagiography and magic, but the storytelling is so masterful, dizzying, and delightful that you can't help but go along for the ride. And if you crave more of Davies's erudite and eclectic writing, know that this is the first book of his celebrated Deptford trilogy. 3. The Handmaid's Tale by Margaret Atwood. In case you haven't seen the TV series or read the book before, here's the summary from the back of the new TV series tie-in edition: "Offred is a Handmaid in the Republic of Gilead. She may leave the home of the Commander and his wife once a day to walk to food markets whose signs are now pictures instead of words because women are no longer allowed to read. She must lie on her back once a month and pray that the Commander makes her pregnant, because in an age of declining births, Offred and the other Handmaids are valued only if their ovaries are viable. Offred can remember the days before, when she lived and made love wit her husband Luke; when she played with and protected her daughter; when she had a job, money of her own, and access to knowledge. But all of that is gone now." The first time I read The Handmaid's Tale, I was in high school reading it on my own and, without guided study or footnotes, a lot of the historical references and nuance went right over my head. This time around—re-reading it in the context of what's happening in American politics, knowing a bit more about history and that Atwood based every aspect of life in Gilead on some sort of historical precedent—I was so disturbed by it I had to take several breaks and reach for lighter fare. The details are chilling, yes, but Atwood's poetic prose does help the story go down easier and the novel is brilliant and timely. I'm in awe of how relevant the story is today considering the book was written thirty years ago. 4. In the Skin of a Lion by Michael Ondaatje. Honestly, it was a toss-up between this book and Running in the Family for this blog post, but in the end I picked In the Skin of a Lion because it focuses on the building and the early history of Toronto in the 1920s and 30s. If that isn't appropriately CanLit I don't know what is. It's been so long since I've read this that the beauty of Ondaatje's writing has faded from memory—perhaps I'll re-read it this summer on the patio with a glass of rosé in hand.